The Methodist Home for Nursing and Rehabilitation is dedicated to providing a comfortable, intimate haven for men and women in need of skilled nursing and rehabilitative care. The Home’s services and programs promote health, dignity and independence to those we serve directly and to our extended community. As a non-sectarian, non-profit residence, the Home is grounded in the vision of the seven Methodist women who founded it in 1850. We are dedicated to ensuring the best quality of life for individuals affected by illness or injury with a wide-range of medical, nursing and rehabilitation services. 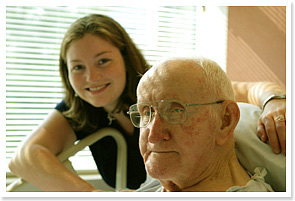 Personalized and compassionate care is offered within the intimate, comfortable setting of our historic dwelling. Comprehensive Support Services – We are a full service organization offering short and long-term care, and physical and social rehabilitation programs conducted by the highest quality medical and care staff. Person-centered Care – We focus on the interests of the individual, by providing tailored care aimed at promoting health, dignity and independence, within a diverse community of people. Ongoing Improvement – The Home maintains its high standards through continual assessment of care methods, regular training and facility and equipment upgrades. Positive Work Environment – By fostering an environment that promotes confidence, self-expression and learning, we empower employees to grow, and gain the mutual respect and trust of residents and their families. Serving the Community – With our outreach programs to local organizations and schools, and the access provided to our services, we are committed to being a conscientious contributor to the Riverdale community and beyond.